The Civil War was fought in many places across the southern landscape, but perhaps no region held as much importance to the Union's Anaconda Plan as eastern North Carolina. Control of the sounds and rivers of North Carolina was vital to cutting off the Confederacy's southern supply routes to Virginia. As the Federal government tightened its blockade, rapidly raising the number of its ships from 42 in 1861 to 671 in 1864, it viewed "the necessity of possessing the North Carolina sounds as well as its Outer Banks." (Left) Map of Civil War era North Carolina coast with forts and batteries located on the outer banks. (Right) Map of North Carolina Outer Banks: A long string of narrow barrier islands off the coast of North Carolina separating the Atlantic Ocean (east) from Currituck and Albemarle Sounds (north) and Pamlico Sound (south). Orbital photo courtesy NASA. The Outer Banks is a series of islands: from north to south — Bodie Island, Roanoke Island, Hatteras Island, and Ocracoke Island. 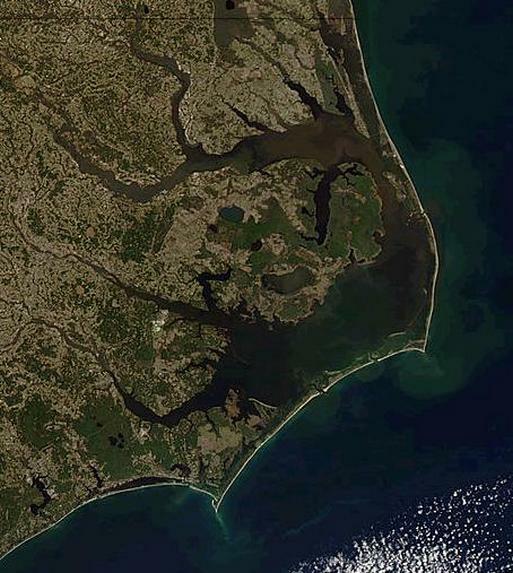 The northern part of the Outer Banks, from Oregon Inlet northward, is usually considered part of the North American mainland, although it is technically separated by the Intracoastal Waterway, which passes through the Great Dismal Swamp occupying much of the mainland west of the Outer Banks. Early in the American Civil War, Union forces were deployed to blockade North Carolina's coast (North Carolina Coast and the American Civil War) and then occupy the islands in order to strangle Southern-friendly shipping and control the deep-water rivers that fed the "sounds." The Atlantic coast of North Carolina was protected by a series of barrier islands, and control of the islands and the bodies of water west of them known as "sounds" was crucial for both sides during the Civil War. Losing the coast, consequently, placed most of eastern North Carolina in danger and threatened the critically important supply line on the Wilmington & Weldon Railroad. The Union referred to its strategy as the Anaconda Plan; the implementation of Union General Winfield Scott's strategy of "divide and conquer." On the Outer Banks, first settlers were fishermen or wreckers. Known the world-over as the Graveyard of the Atlantic, the waters off the Outer Banks are littered with the bones of thousands of ships that have met their fate. Many Outer banks' home were built from the lumber salvaged from shipwrecks. No large-scale battles were fought in the Albemarle Sound, but dozens of small strategic battles were waged for control of the region. The first strategic move on the region arrived with General Ambrose Burnside's Union expedition, a.k.a. Burnside's North Carolina Expedition, to capture Hatteras Inlet in late 1861. After a brief sea and land battle, the two Confederate forts that controlled inlet access fell into Union hands. From there, Burnside quickly advanced up Pamlico Sound and captured Roanoke Island. Now, Burnside had a base of operations from which to conduct a systematic conquest of the northeastern and central part of the coast. Although Roanoke Island was the site of one of the largest battles in the state, today there is no physical evidence of the fight. The fall of Roanoke Island, however, is remembered for another notable reason: it became a haven for escaped and freed slaves who sought the protection of the occupying Union army. By 1863, nearly 3,000 freedman had settled on the island and established the first Freedman's Colony of the war. High Resolution Satellite Map of North Carolina. Courtesy Bing Maps 3D. (About) High Resolution Satellite Image of North Carolina. This satellite image of North Carolina contains a map with principal cities and highways. Try to locate the three regions of North Carolina -- Coastal Plains, Piedmont, and Mountains -- by its terrain. The coast hosts two large sounds known as Albemarle and Pamlico, and they are protected by a series or string of barrier islands known as the Outer Banks. The Wilmington & Weldon Railroad ran between Wilmington, NC, and Richmond and soon became one of the most important supply routes for the Confederacy. Thus, Burnside launched a series assaults up the Albemarle Sound in an attempt to capture the line and control the waterways. The undersupplied Confederates defended the towns as best they could with a motley collection of armed boats called the "mosquito fleet." Elizabeth City was first to fall, then Edenton with barely a shot fired. The Federals then occupied Plymouth, during the Operations against Plymouth, which cinched their control of the Albemarle Sound. Plymouth changed hands several times during the war and was the focal point of much of the fighting in the Albemarle region. The Confederates had succeeded in building a formidable ironclad, the CSS Albemarle, which prevented Union ships from capturing the town via the Roanoke River. Finally, on October 27th, 1864, in one of the most daring maneuvers of the war, Federal soldiers slipped over to the CSS Albemarle under cover of night, planted an explosive using an improvised torpedo boat, and sent the ironclad to the bottom of the river. However, Union forays up the Chowan and Roanoke Rivers were not as successful, thanks to heavy defensive positions such as Fort Branch, which commanded the Roanoke River above Williamston from a high bluff. The Wilmington-Weldon Railroad remained in operation until the end of the war. Perhaps the most historically valuable Civil War site is located in 300 feet of water off Caper Hatteras; that is where the crew of the USS Monitor met their fate on a stormy New Year's Eve in 1862. For 100 years, her resting place remained a mystery. Then, in 1973, a Duke University research team located her lying upside down on the sandy bottom 190 miles southeast of Cape Hatteras. The site was placed on the National Register of Historic Places in 1975. The North Carolina Coastal Region was host to the English Roanoke Colony—where the first person of English descent, Virginia Dare, was born on American soil—but all had vanished from Roanoke Island in 1587. The Lost Colony, written and performed to commemorate the original colonists, is the longest running outdoor drama in the United States and its theater acts as a cultural focal point for much of the Outer Banks. Although Black Beard met his fate off the coast, so did many merchant ships during WWII in what is now known as Torpedo Alley. The treacherous seas off the Outer Banks and the large number of shipwrecks that have occurred there have given these seas the nickname Graveyard of the Atlantic. The North Carolina coast also witnessed the Wright brothers' first flight on the Outer Banks on December 17, 1903, at Kill Devil Hills near the seafront town of Kitty Hawk. But to those who live and vacation in the region, it is truly a seaside paradise. Recommended Reading: Ironclads and Columbiads: The Coast (The Civil War in North Carolina) (456 pages). Description: Ironclads and Columbiads covers some of the most important battles and campaigns in the state. In January 1862, Union forces began in earnest to occupy crucial points on the North Carolina coast. Within six months, Union army and naval forces effectively controlled coastal North Carolina from the Virginia line south to present-day Morehead City. Union setbacks in Virginia, however, led to the withdrawal of many federal soldiers from North Carolina, leaving only enough Union troops to hold a few coastal strongholds—the vital ports and railroad junctions. The South during the Civil War, moreover, hotly contested the North’s ability to maintain its grip on these key coastal strongholds. Recommended Reading: The Civil War on the Outer Banks: A History of the Late Rebellion Along the Coast of North Carolina from Carteret to Currituck With Comments on Prewar Conditions and an Account of (251 pages). Description: The ports at Beaufort, Wilmington, New Bern and Ocracoke, part of the Outer Banks (a chain of barrier islands that sweeps down the North Carolina coast from the Virginia Capes to Oregon Inlet), were strategically vital for the import of war materiel and the export of cash producing crops. From official records, contemporary newspaper accounts, personal journals of the soldiers, and many unpublished manuscripts and memoirs, this is a full accounting of the Civil War along the North Carolina coast. Recommended Reading: American Civil War Fortifications (1): Coastal brick and stone forts (Fortress). Description: The 50 years before the American Civil War saw a boom in the construction of coastal forts in the United States of America. These stone and brick forts stretched from New England to the Florida Keys, and as far as the Mississippi River. At the start of the war some were located in the secessionist states, and many fell into Confederate hands. Although a handful of key sites remained in Union hands throughout the war, the remainder had to be won back through bombardment or assault. This book examines the design, construction and operational history of those fortifications, such as Fort Sumter, Fort Morgan and Fort Pulaski, which played a crucial part in the course of the Civil War. North Carolina Outer Banks: Albemarle Sound and Pamlico Sound, List of North Carolina Forts, Batteries, Battles, Battlefields, Civil War Maps, North Carolina Coast American Civil War History, Facts, Details. Sources: Historic Albemarle Tour, Inc., historicalbemarletour.org; Official Records of the Union and Confederate Armies; North Carolina Office of Archives and History; Geology.com; Diary of Gen. Winfield Scott; Map of Albemarle and Pamlico Sounds courtesy Microsoft MapPoint; Map of North Carolina courtesy Microsoft Virtual Earth; Satellite View of North Carolina courtesy Microsoft Virtual Earth (3D).